Superior quality Iron Patio Furniture never goes out of fashion. Today's Iron Patio Furniture is available in every imaginable style to complement your own personal tastes and existing décor. At BackyardCity.com, you can find Iron Furniture that is reminiscent of a bygone era as well as furniture that is contemporary, and even futuristic, in design. We offer Iron Furniture with romantic curving lines and ornamental accents in addition to furniture that boasts sleek, modern lines in the minimalist tradition. Iron Furniture not only looks beautiful, but it is also extremely comfortable. Many of our offerings are designed with comfort, as well as appearance, in mind. As a result, lingering outside on your patio, deck, or in your garden is easy and satisfying when you are seated at one of our Iron Patio Furniture Sets. The Iron Patio Furniture that you find at BackyardCity.com can be used year round because we select only the finest, most durable furniture to bring to you at discounted prices. All of our Iron Patio Furniture selections have a special powder coated finish for exceptional durability in any kind of weather. Whether you are searching for Iron Outdoor Patio Furniture that is romantic, sophisticated, casual, elegant, or contemporary, you will find what you have been looking for here. 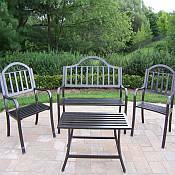 Please click any link or photo below to read more details about our Iron Patio Furniture Collections.